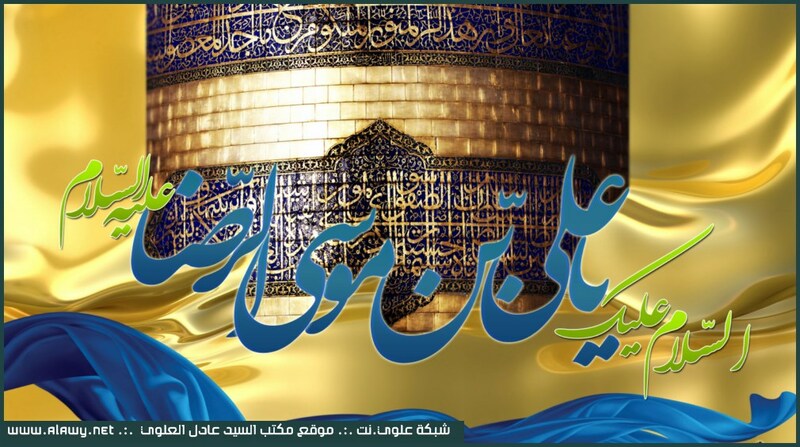 Happy Maulud Imam Ridha (AS) Garib Tus. Imam Ridha’s shrine is from the gardens of paradise. The prosperous in the paradise (its width is like the heavens and earth) he will find eternal peace and sense it (paradise). Allah the exalted, has put on the earth with his mercy, wisdom and generosity a sense of what is in the paradise that he has prepared for the pious ones. If Allah would open the vision of a Man, he would have seen with clarity that this spot (earth) is a garden from the gardens of God. It is the sins and crimes of a human being that obscure him from seeing the reality, so he ask about it. And from it (the garden of God) in the other world is what is in between the grave of Prophet Muhammad (SAW) and his podium. It has been reported in the hadith an nabawiy, authenticated by both groups. Between my home and podium. Al kahfi, it has been collected from Abu Abdullah, he said: the prophet said: between my house and my podium is a garden from the gardens of paradise. And my podium from the canal of paradise. The steps on my podium are the levels of the paradise, he said: “you said” it is today’s (THE SHRINE) garden? He said: yes, if will be uncovered you would have seen it. If someone is able to see what is covered and is Ahl shuhud and Muayina (أهل الشهود والمعاينة) then obviously he sees that paradise and what it means, and how he can rest in it, and enjoy it riches. In it the soul get whatever it desires, that which will never occur in the heart of a human. The goal of paradise is to be a resting place forever, spiritual and physical for the believers. And a judgment house for faith and good deeds, which is specifically for believers. It has levels, steps and positions. There are those that will live in the first class, and there are those that will be neighbors to the prophet (SAW) and around him, based on the levels of the light of their faces. There is the Jannah Al firdaus, Darus- Salam, and Jannah Al ma’awa, and the highest in rank is the Jannah Al’asma wa Sifat, it is particularly for Awliya Ullah, they are the people that have the assured souls, that which will go back to it creature well-pleased and pleasing to him. Whoever visits Holy ka’aba and The Prophets shrine between his house and his podium will have spiritual peace of mind, It is like he is in jannah and a garden between Haur and Wildan Muqarrabin, the Angels will be parading around him with pitchers made from gold and silver and cups of pearl and coral, there will be no pains or anger until he forgets himself, and forget the worries of dunya and it troubles. It will be as though he is living in another world, relaxed mind and reassuring mind. He will understand the blessings of jannah, it has been narrated and also in Koran that, all this are because of the holy prophet and his holy household. And the accepted visit, a visitor if he opens his vision and hearing will hear the answer of his Salam to his Imam and sees the reality of things as they are. From that garden is the shrine of Imam Ridha, God has uplifted its position and made it respected and bless what is around it. Divine light shines from it to the whole world. Biharul Anwar, collected from Abu hassan Ar-ridha, that he said: indeed, in Khorasan there is a spot where a time will come that it will host many angels, at every moment they will be coming from the heaven in multitude and another in multitudes leaving to the heaven from there till when the trumpet will be blown. Then it was said: O, son of the prophet, which spot is that? He said: is the land of Tus, and it is I swear by Allah a garden from the gardens of Jannah. Whoever visits me there is like he visited the prophet, and God has write for him with that 1000 hajj and a 1000 Umrah too, me and my parents will be his saviors on the Day of Judgment. Like This narration which is also used as evidence for the imamate of the Imam, it is from the ahadith gaibiyyah, before his martyrdom, he mentioned where he will be buried and it should be a place of pilgrimage for his lovers until the day of judgment. And that the angels come to and fro between the heaven in multitudes and the shrine till when the trumpet will be blown. What is greater than that? How can his visit not be in the same with visiting the prophet? How will the visitor be not rewarded with 1000 hajj and umrah? How can they not be his saviors? How can that spot not be one of the divine places that whoever enters will be safe from sins and the panic of the biggest day? From Abu Hashim Al-ja’afari, he said: I heard Abu jafar saying: indeed, between the mountain of Tus is a place from the places of Jannah, who enters is safe from the hell-fire in the Day of Judgment. How can that holy place not be blessed by God? From Imam Sadiq (AS), four places God has uplifted their positions on the day of Tufan, Baitul-Ma’amur, An-najaf Al-ashraf, karbala and Tus. Your graves are like other graves only that God has uplifted your positions and status, indeed, your shrines are the gardens of Jannah Al-firdaus, only those who are very lucky will meet see it, and those that come to God with sound heart.